There may be no better reason to stash persimmons during fall persimmon season than this recipe. 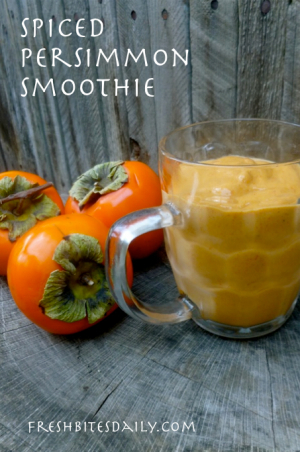 We freeze the persimmons whole (though you could freeze puree) and simply pop them in the blender with the other ingredients. If you are new to persimmons, you should know that if the persimmon is not dead-ripe, it will cause your mouth to get a strange scratchy feel. Abusing your mouth is not really what we have in mind for this recipe, so do be sure to use a ripe persimmon. If you are concerned about that scratchy sensation, you can puree your persimmon in batches and cook it to remove the substance. Freeze your cooked puree and you should have no problem. The beauty of this recipe is that the sweetener comes from the ripe persimmon itself. It doesn’t really need more unless you are working toward “milk shake” and want a sweeter drink. In that case, maple syrup is an exceptional choice. Place all ingredients in a blender. Blend. Taste for spice and sweetness. Add more as desired. 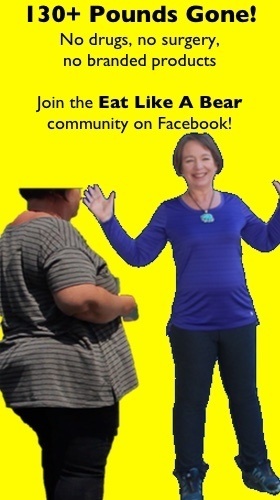 5 Comments on "What DO you DO with that strange orange fruit? It doesn’t get easier than this…"
Stores usually don’t carry ripe persimmons, because they’d spoil before they could sell them all. So, how does one “ripen” a persimmon after purchasing, without them then going bad? No matter how I try, by letting them sit out on the counter, they either never ripen, which confuses the heck out of me! OR, they suddenly become over ripe or unappealing looking. Help! I wonder how a spiced persimmon tastes. I haven’t tasted an actual persimmon. I am wondering what you do about the seeds in the persimmons. 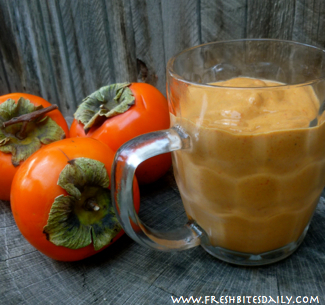 Do you simply blend them in with the whole persimmon? I have a persimmon tree in my yard but have never done anything with them…probably because the only one I ever tried must not have been ripe. Mine has several big seeds in each fruit. So do you NOT peel the persimmon before you use it?